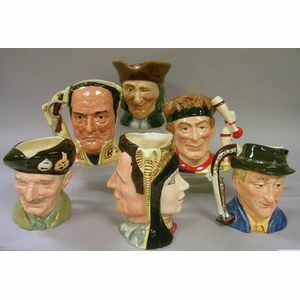 Six Large Royal Doulton Character Jugs, The Juggler D 6835, The Vicar of Bray, Antony & Cleopatra D 6728, The Antique Dealer D 6807, Monty D 6202, Davy Crockett/Antonio Lopez de Santa Anna D 6729. Wedgwood Mortar and Pestle, Dark Blue Jasper Dip Portland Vase, and an Enamel Floral Decorated Basalt Two-Handled Vase. 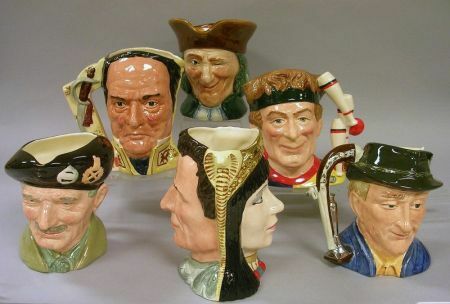 Twenty-four Pieces of Modern Wedgwood Jasper Jewelry.